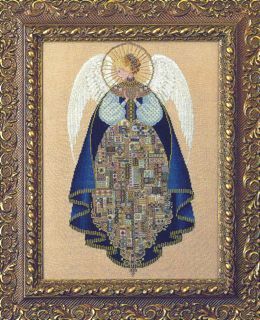 Since the skirt of this angel is 90% beads and rich metallic threads, I consider the completion of this angel to be an act of love. Stitched on 28 count Amber Linen (2 over 2) from Wichelt. 9 3/4" x 17 1/2"
Balger threads from Kreinik Manufacturing.